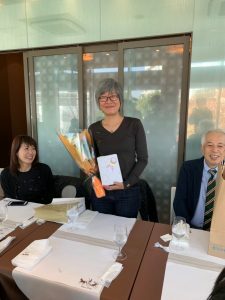 On 27 November, we held a party at “Ueno-seiyoken Ookayama Station Front Restaurant” which serves both for Asakura-sensei and Judith-sensei. Here are a few pictures of the middle of the party. 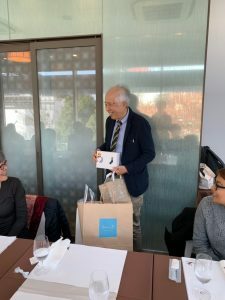 We gave Asakura-sensei two pairs of socks and a bouquet. On the other hand, we also gave Judith-sensei Japanese green tea(Gyokuro) and a bouquet. It seemed like they are having a great time! !